This IBM Redbooks publication provides suggestions on how to approach problems that may occur in a Domino production environment on the S/390 platform. The first part of the book covers architecture and terminology to familiarize you with the environment. The second part contains step-by-step approaches to enable you to track down the source of a problem and take steps to fix it. 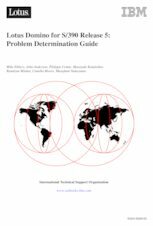 The third part contains tools and resources that you can use during problem determination. The appendix contains worksheets and other helpful information. This book assumes some knowledge of Domino and OS/390 operations. The intended audience is UNIX and OS/390 system programmers, Domino administrators, and other people who support a production Domino system in the OS/390 environment.